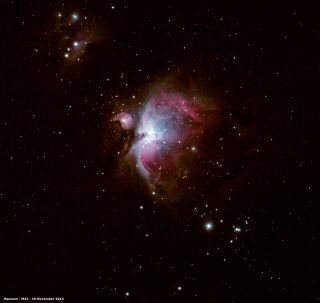 Amateur astronomer Keith Hanssen took this image of the Orion Nebula in November from Montana. This stunning image of the Orion Nebula shows the bright, colorful region of the celestial object. Amateur astronomer Keith Hanssen took the image in November from Montana. "I had purchased a telescope for the first time in my life earlier in 2013 after retiring and moving to Montana. In the summer of 2014 I started taking a few deep sky objects but I was always waiting for the Great Orion Nebula to return to the evening sky," Hanssen wrote in an email to Space.com.